SOLD Vintage jewelry with the hallmark "DeMario-Hagler" is not easy to find with good reason. It seems that back in the mid 1960s the two designers thought about a collaboration which did not pan out. The findings, such as the earring clips here, on which the hallmark is stamped, were made and when the partnership did not work out the findings were thought to have been used by Hagler. There is another rare hallmark "DeMario for Hagler" which should not be confused with the mark on these earrings. The backing for the very large statement making domed earrings is gold plated and filigree. 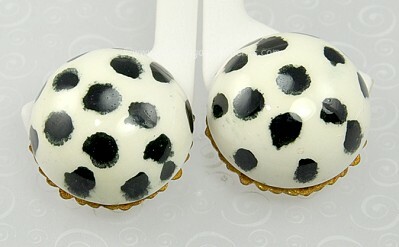 The near white domes have black spots all over and the material feels like resin or stone. It is hard with a smooth shiny finish. Condition: Excellent vintage. There is light wear to the filigree backing. Measurements: 1 1/4" in diameter and about 3/4" tall.